The main purpose of this project is to offer a new experience of tourism, which is quiet and familiar where leisure and cultural expression, the ibizan folklore, keep their own space highlighting the sustentability, the protection and the appreciation of the natural environment to welcome and sensitize those who visit the island. 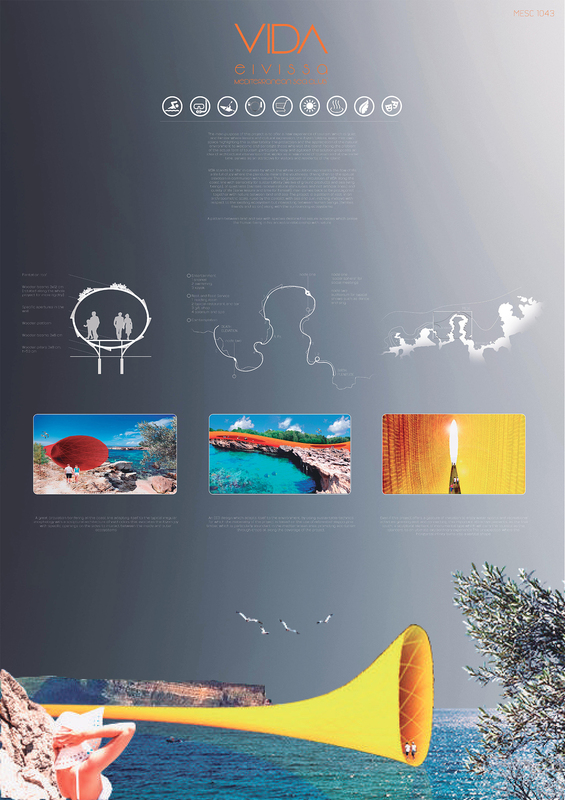 Facing the problem of the actual form of tourism, particularly noisy and agitated, this solution proposes an idea of architectural intervention that works as a new model of tourism and at the same time, serves as an attractive for visitors and residents of the island. VIDA stands for life in catalan by which the whole circulation represents the flow of life, a life full of joy where the plenitude means the youthness, driving then to the spitual elevation in communion with nature. The long pattern of circulation of VIDA along the coast line with sensibility for sustentability (we live of ground products and sea living beings), of quietness (senses receive natural stimuluses and not artificial ones) and quality of life (sane leisure and time for himself); man comes back to be protagonist together with nature between land and sea. The project is a pattern of rest, in an anthropometric scale, ruled by the contact with sea and sun; nothing invasive with respect to the existing ecosystem but interacting between human beings (families, friends and so on) along with the surrounding ecosystems. A pattern between land and sea with species destined to leisure activities which praise the human being in his ancestral relationship with nature. Gracias por la experiencia, fue muy interesante! !